I love roasted beets and when I saw this recipe in a magazine that I picked up from the pharmacy, I just had to try it. The recipe was something I just had to try as it contained healthy ingredients that I already enjoy. While the beet burgers had a good taste to them, I think next time I will leave the beets or use gold beets, out as the red color of the burgers was just not my thing. Make sure to have your brown rice and lentils cooked before starting the recipe. 1. Preheat oven to 375 F. In a small pan, heat the oil and saute the onion over medium-low heat until soft and golden. Add garlic and cook for 2 more minutes. 2. Grate the beet with a grater or in a food processor. Combine the grated beet, onion/garlic, spices, brown rice, lentils, and walnuts in the food processor and pulse until combined. Add the egg and pulse a couple of times. Add the oats and pulse until combined. Let the mixture sit for 10 minutes. 3. Using a 1/2 cup measuring cup, form the mixture into 6-8 patties. Kitchen gloves will keep your hands from turning colors or use a spoon to fill the measuring cup and then tap the cup onto a pan lined with a silicone mat or parchment paper. Use a spoon to flatten the patties. Bake for 12-15 minutes or until patties are not mushy. Serve the burgers on buns with cheese if desired. So are you brave enough to try these red beet burgers? My mother is a beet FIEND! She'd love this! I didn't use to like Beet but have recently had some very good and well prepared beet that was insanely good! I love eating healthy and cooking veggie when I can so I will pin this and try it out! Thanks! This looks so good! I love how easy to make it is and that it is healthy as well! Thanks for sharing, I will definitely have to make it soon. How delectable! This dish will be the star of my summer cookouts and picnics! 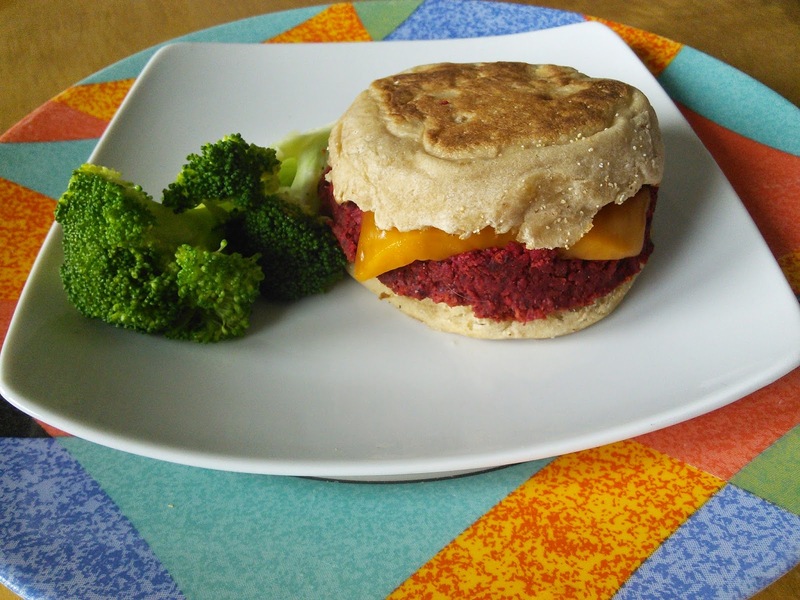 I am delighted that you shared your healthy and delicious Vegetarian Smoky Beet Burgers recipe with us on the Plant-Based Potluck Party Link Up. I appreciate it and I can't wait to try your recipe. I'm pinning and sharing.